Content Station allows you to open any type of file for editing including files that are not edited with Content Station itself. InCopy files are by default opened in the Print editor or can optionally be opened in InCopy. 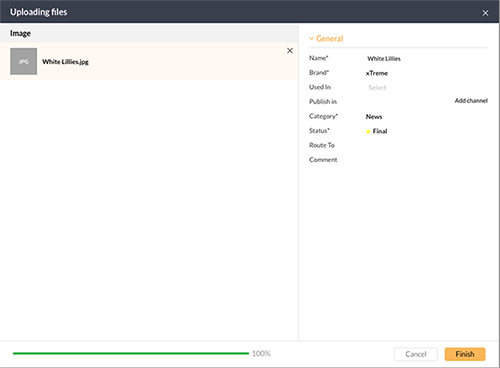 After editing the article in Content Station, it can be saved back to Enterprise from within Content Station; after editing the article in InCopy, it can be saved back to Enterprise from within InCopy using Smart Connection. InDesign layouts are directly opened in InDesign. After editing the layout, it can be saved back to Enterprise from within InDesign using Smart Connection. All other file types are opened in the default application for that file type on the system. After editing the file, it can be saved back to Enterprise using Content Station. Example: You can download a Photoshop file from within Content Station, edit the file in Photoshop and save the changed version back to Enterprise using Content Station. While you are editing a file, it is important that other users cannot make any changes to the same file. To prevent this from happening, the file is 'checked-out' (locked) when you open it. When you are done working on the file, you 'check-in' (unlock) the file which makes it available for other users to edit. Note about InCopy articles: This concept applies to all files but is slightly different for InCopy articles that are opened in the Print editor of Content Station 10 (which is the default setting): these are also automatically checked-out when opened but they are also automatically saved and when leaving the article open for a while without making any changes, the file is automatically checked-in allowing other users to open the article and edit it. For the Check-out / Check-in feature itself: Content Station 10.5 or higher (not supported when using Content Station 10 on a tablet). Files are downloaded locally and need to be opened manually. For opening layouts directly in InDesign: Content Station 10.8 or higher, running in Google Chrome, and using the Desktop App. In InDesign, Smart Connection needs to be installed. For opening layouts in InDesign CC 2017, the Content Station Desktop Application version 1.1.0 or higher is required. For opening articles directly in InCopy: Content Station 10.15 or higher, running in Google Chrome, and using the Desktop App. In InCopy, Smart Connection needs to be installed. For opening articles in InCopy CC 2017, the Content Station Desktop Application version 1.1.0 or higher is required. For opening all other types of files directly in an application: Content Station 10.11 or higher, running in Google Chrome, and using the Desktop App. For using the Check In command in the context menu: Content Station 10.14 or higher. The file is automatically downloaded to your system (see Location of checked-out files). (Content Station 10.28 or higher) The Download Progress window appears showing the file(s) that are currently being downloaded. When the download is complete, the window automatically disappears. The file is locked for other users so that they cannot edit it (as shown in the In Use By icon and name). 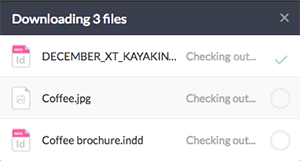 The file is added to your 'Checked-out files' page (as shown at the top of the page). The file is automatically opened (see requirements above). Figure: The total number of files that you have checked-out is shown at the top of the page (A). For files that are checked-out (either by yourself or by another user) an icon and the user name appears in the In Use by columns (B) in List view mode. In Thumbnail mode an icon is shown on the thumbnail. Figure: The Download Progress window automatically appears while a file is being downloaded. It automatically closes when the download is completed. For Content Station versions 10.5 – 10.10 in which files need to be opened manually or when using Content Station in a Web browser other than Chrome: automatically in the Download folder or in a folder of your choice, depending on your Browser settings. 1 This is the name as configured in Content Station. When you have checked-out a file and decide that you actually don't want to edit it, you can cancel the check-out (this process is referred to as 'aborting' the check-out). Step 1. Right-click a file and choose Abort Check-out. The lock is removed from the file so that other users can edit it. The original version of the file has not changed. Step 2. (Optional) Manually remove the downloaded file that still exists on your system. At any time you can (re-)download a checked-out file by simply double-clicking the file again. All files that you check-out are listed on the Checked-out Files page. Access it by clicking the 'Checked-out Files' icon at the top of the page. Figure: The Checked-out Files page shows all files that you have checked-out. After editing the file, the updated version needs to be saved to Enterprise. This is done by uploading it with Content Station. It is possible to change one file format for another, for example: replace a PNG file with a PSD file. It is not possible to change one file type with another, for example: replace a Word document for an image. This scenario describes the workflow of using Google Chrome in combination with the Desktop App. Right-click a file anywhere in Content Station and choose Check in from the context menu. 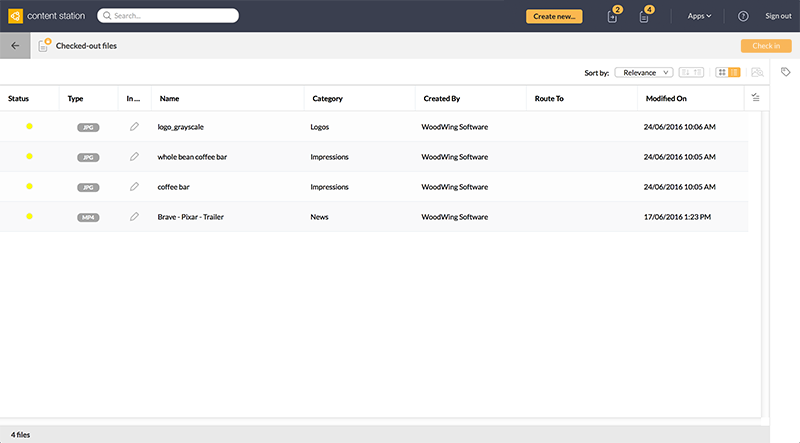 On the Checked-out Files page, select one or more files and click Check In. The Uploading Files window appears. The edited file is automatically uploaded but not yet checked-in. Step 2. (Optional) When the file has been changed into a different format, the file in the new format is treated as the default file while the original file and any other file formats that have been saved are available in a list. When needed, choose the file that should be checked-in from the list. Step 3. (Optional) Change the properties for one or more files by selecting them and using the Properties panel on the right. The original file is replaced by the updated file. The file is removed from the Checked-out Files page. The file is checked-in (unlocked) so that others can now edit it. The downloaded file is automatically removed unless multiple file formats exist, in that case you are asked which files to remove. Click Check In. Browse to the updated file(s) and click Open. Based on the file name, the selected files will be matched as best as possible with the available checked-out files. Step 2. 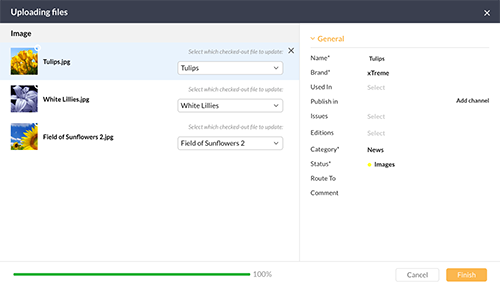 (Optional) If the file name that is used for updating does not match the file name of the checked-out file, choose the correct file from the list. Step 3. (Optional). Change the properties for one or more files by selecting them and using the Properties panel on the right. Step 5. (Optional) Manually remove the downloaded file(s) from your system. 10 August 2017: Updated section 'File check-out' with information about the Download Progress window. 30 January 2017: Added articles templates to the list of files that cannot be checked out. 23 January 2017: Added right-clicking a file and choosing Check in as a new method for checking-in files. 18 January 2017: Changed references of the 'text editor' to 'Print editor'.